Mack McCray received his B.M. and M.S. from The Juilliard School, where he studied under Irwin Freundlich. He won the Silver medal in the International George Enesco Competition, first prize in the Charleston Symphony and San Francisco Young Artists competitions, Juilliard's Edward Steuermann Memorial Prize, and a grant from the Martha Baird Rockefeller Foundation - all in one season (1969-1970). He has been invited guest artist at the Festival d'Automne in Paris, Seville's Great Interpreters Cycle, the UNESCO Festival of International Artists at Monte Carlo, the Bucharest Philharmonic's Bach/Beethoven/Brahms Festival, and the Hong Kong City Hall Series. He has performed under such conductors as Michael Tilson Thomas, Edo de Waart, Josef Krips, Leon Fleisher, and Arthur Fiedler. In 1991, he performed the U.S. premiere of John Adams's Eros Piano. Recently he has performed with the Japan Philharmonic in Suntory Hall, Tokyo, at the Carmel Bach Festival and on the Trinity Church Concert Series in Manhattan. Mack McCray is Artistic Director of Zephyr International Chamber Music Festival, held annually in Courmayeur, Italy, and since 1971 he has been on the faculty of the San Francisco Conservatory of Music. Meikui Matsushima graduated from the Toho Music College in Tokyo , Japan , and continued her studies at The San Francisco Conservatory of Music where she is currently a member of the piano Faculty of the Preparatory Division. She taught at the International Music Course and Festival in Positano , Italy from 1998 to 2001, served two terms as president of the San Francisco Chapter of the California Association of Professional Music Teachers, and was Program Director of the 1999 San Francisco International Summer Music Festival. Currently she is Administrative Director of Zephyr International Chamber Music Festival in Courmayeur, Italy. Qianshu Xia, a native from China, earned her Bachelor's degree at Fudan University and later came to the US as a full scholarship recipient. She earned her Master's degree in East Asian Studies and Literature at UCSB, as well as a Master's degree in Chinese Studies at Stanford. She taught Chinese both at UCSB and Stanford as an teaching assistant and an independent instructor. She is now a stay-at-home mom taking care of her two boys. Her oldest son, Kelvin, has been studying piano since age 5, and the younger one, Aiden, has been studying violin since age 4. Nagisa was born in Japan, and started studying piano at age four. She trained at the Music School for Children, which is affiliated with Toho- Gakuen University, and graduated with honors from Tokyo College of Music. She studied with Professor Takashi Hironaka and Aiko Iguchi while attending the college. She also completed a period of study under Professor Alexander Jänner at Hochschule Für Musik in Vienna in 1982. After graduation from college, she taught at Yamaha Music School and performed in many concerts. She relocated to California in 1993 and her first piano recital in the United States was held at De Anza College, June 1996. Since then, she has performed several times as a guest pianist with the De Anza Chamber Orchestra at the Flint Center and had solo recitals in Bay Area’s venues. She has also performed in private recitals. As a chamber musician, Nagisa has performed in piano trios, piano duets, and two pianos. 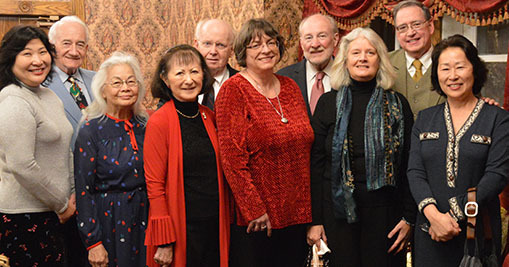 Distinguished teachers of Nagisa Ariza include Emi Maruyama, Hiroshi Miura, Nobutatsu Kawashima, Japan, Mrs. Hauser, Austria, and Mrs. Anna Poklewski and Irina Sharogradsky in U.S.A.
Robert, a human-rights attorney, is a member of the bar of California, New York, Alabama, and the U.S. Supreme Court. He began taking piano lessons at the age of six and has been actively involved in music throughout his life. Robert’s mother was an accomplished pianist who also sang opera, and brother a cellist. His daughter, Auda Mai, studied piano with Alla Dobrish and then under Machiko Kobialka at the San Francisco Conservatory of Music, was a music scholarship student at Rugby School, England, is now at the University of London’s Royal Holloway College, and will be at Göttingen University, Germany for a year before returning to the UK. Nicole, Robert's former wife, was active in San Francisco's classical music scene for years and is now similarly involved in Berlin. Emi Sunahara was born and raised in Tokyo Japan. Graduated from Musashino College of Music in Tokyo. Emi studied piano performance and child psychology at the University of Oregon. Her teachers were Professors Sadakatsu Morita, Leonid Kochansky, William Woods and Anna Poklewski. Emi was a past president of the Music Teachers' Association of California-San Mateo Branch, Director of Junior Auxiliary and a Board of Director at the Pacific Musical Society. Emi maintains a piano studio in Foster City, California.